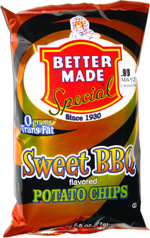 Taste test: These tasty barbecue chips were crisp and had a soft crunch. 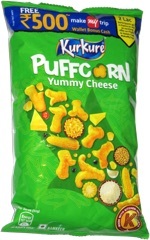 The flavoring was quite good, with a a generous supply of a just slightly sugary flavor powder on the chips. The taste was just a little bit to the sweet side of center of the barbecue spectrum, with no heat and no hot aftertaste. A good barbecue chip. Smell test: Smells like hot sauce.